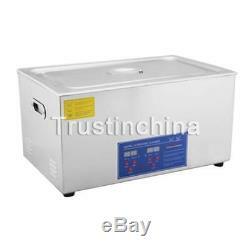 22L Liter 480W Stainless Steel Industry Heated Ultrasonic Cleaner with Heater Timer. Ultrasonic cleaning is based on the cavitation effect caused by high frequency ultrasonic wave vibration signals in fluid. Microscopic bubbles that expand and rapidly collapse cause cavitation, which creates an effective cleaning action on the surface of object being cleaned. Additionally, the bubbles are small enough to penetrate even microscopic crevices, cleaning them thoroughly and consistently. High efficiency saves cleaning solvent, thermal energy, work place and labor! Four sets of built-in powerful transducers can strengthen the ultrasonic power and make superior cleaning outcome. It is utilization of digital program in ultrasonic cleaner to control the unit, according to the quantity and condition of the items to be cleaned to choose a working cycle time. As a result, it is more convenient and efficient than hand wash, steam cleaners, high pressure water jet cleaning or other machines. Advanced Brushed Stainless Steel Cleaning Tank to avoid corrosion water stain and keep the tank looking always new. In comparison, the common stainless steel cleaning tanks will be dirty yellow corrosion water stain on the surface after a long time of using, and it's hard to be removed. Features: - Durable stainless steel construction. Ultrasonic cleaning and heating can work at the same time. High efficiency cleaning for teeny blot particles. Perfect for cleaning the longhole, finedraw and shelter of piece part or workpiece, no need to touch cleaning fluid by your hands. Large digital timer and temperature display for precise wash time and temperature control. CE, FCC and RoHS Approved. Built-in Powerful Transducer can strengthen the ultrasonic power and make superior cleaning outcome - Stainless steel cleaning basket for cleaning some small objects which need less friction, it can reduce the friction between the small objects and the tank. Stainless steel tight fitting lid with handle to prevent water heat from diffusing. Drains with Flow Control Valve for easy cleaning and rinsing - Skidproof rubber feet. Use only tap water for general cleaning, you also can add about 5-10 ML of detergent into water to enhance wash result when needed. Save cleaning solvent, thermal energy, work place and labor. Specification: - Tank Material: Stainless Steel SUS304 - Heating Power: 600W - Ultrasonic Power: 480W - Frequency: 40kHz - Power Supply: AC110V-120V 60Hz - Tank Capacity: 22L - Time Setting: 1 - 30 minutes (LED Digital Display) - Temperature Setting: 0-80 degrees Celsius - Transducer Quantity: 8 set - Tank size: 19 1/2" x 11 1/2" x6" (LxWxH) - Ultrasonic cleaner size: 22"x13"x11" (LxWxH) Application. Professional Use: Medical and Dental Clinics, Tattoo Shops, Scientific Labs and Golf Clubs. Jewelers, Opticians, Watchmakers, Antique Dealers and Electronics Workshops etc. Personal or Home Use: Jewelry: Earrings, Necklace, Rings, Bracelets and Diamonds. Glasses and Timepieces: Glasses, Sunglasses, Optical Lenses, Contact Lens Accessories, Watch Chains and Waterproof Watches. Commodities: Tattoo Guns and Tubes, Electric Shaver Heads, Razor Blades, Dentures, Combs and Toothbrushes. Stationery: Pen-heads, Printer-heads, Inkjet Cartridges and Seals. Metal Articles: Ancient Coins, Badges, Valves, Machine Nozzles, Electronics Components and Mechanical Parts. Metal Dishware: Forks, Knives, Spoons and Other Small Silverwares etc. Package included: - 1 Ultrasonic cleaner - 1 Cleaning basket - 1 Instruction manual. The item "22 L Liters Pro Stainless Steel 1080W Digital Ultrasonic Cleaner Heater Timer" is in sale since Tuesday, April 26, 2016. This item is in the category "Business & Industrial\Healthcare, Lab & Life Science\Lab Equipment\Cleaning Equipment". The seller is "trustinchina" and is located in Walton, Kentucky. This item can be shipped worldwide.